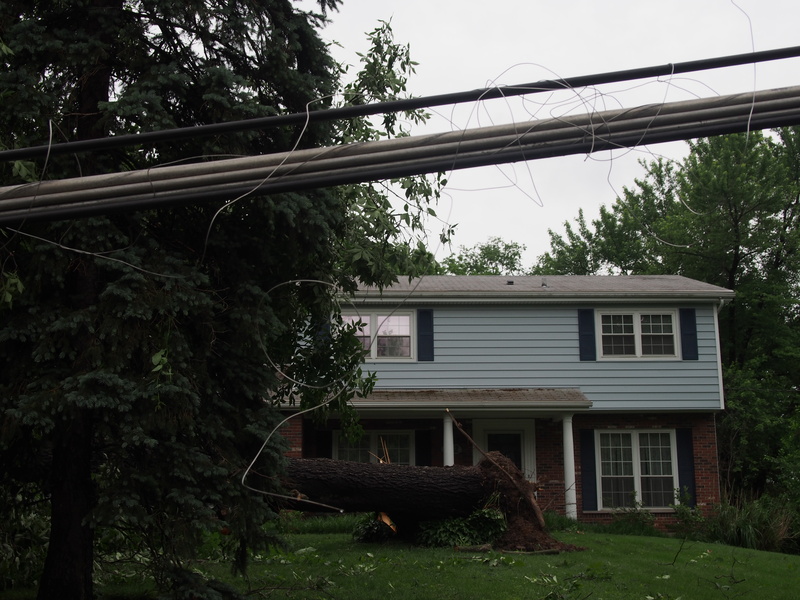 A fallen tree in front of a house on Darst Rd. Spring has been wild this year in St. Louis. A tornado hit Hazelwood in April, and then last Friday a much bigger tornado came through. It began in St. Charles and swept across North County, including Ferguson. Hard to believe that one year ago tonight was Good Friday. My parents were at church. I was at work. My family was at home. And they were right in the path of a tornado that cut across north St. Louis County. We’ve come quite a ways since that day. Check out this video of the action. This year, the final day of our anniversary falls on the same day as Thanksgiving. There is much to be thankful for, so much of it obviously connected with the tornado that wrecked our house in April. To the creators of Wheel of Fortune, for a show the family enjoys watching, which ensured they saw the tornado warning on TV in plenty of time to go downstairs. To our neighbors who checked helped Yoli and the kids get out of the basement through a window and let them stay in their house until I got there. To my brother Justin for connecting us with a contractor who did above and beyond what we hoped might be possible in rebuilding our house. To my dad who was there the morning after the tornado, and on many other days afterward, to offer help and advice as we figured out what to do. To my mom for, among many other things, finding a notice about a house for rent and passing it on to us. We spent a good 6-7 months in that house. To all our friends and family who helped after the tornado with gifts, with time, with advice, with words of comfort. To the St. Louis Post-Dispatch for continuing to give me a job that I enjoy doing. To my coworkers, who sent us a gift of help after the tornado, and who nominated us for an obscure Lee Foundation grant that our family was eligible for. To God for our home, for supplying our needs, for love, for everything; but mostly for our lives. 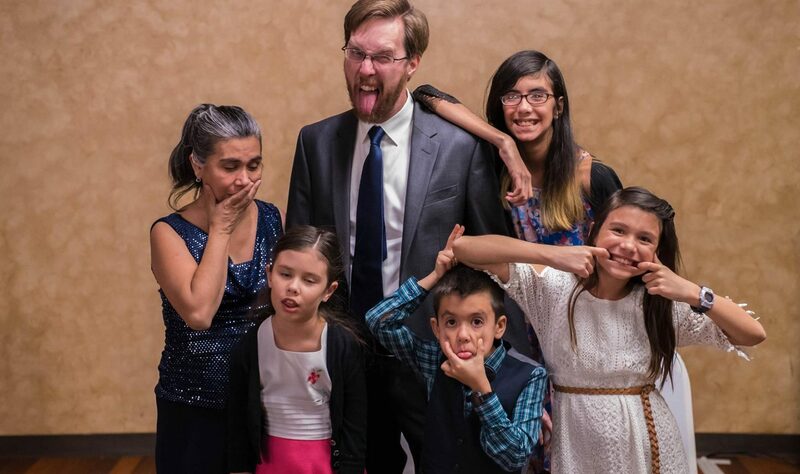 If Yoli or one of the kids had perished in the tornado, this year would have been inconceivably different. To that darn tree: I loved you for your tallness, for the cool shade you provided. You have given us a year of work and waiting, a new house — and fewer leaves to rake. Maybe waiting is the measure of a man. We have done our share of it. Today, I daydreamed back to a sweltering Bolivian night eight years ago when we made pizza for Yoli’s family and I got down on one knee to propose. Not many days afterward, I boarded a plane bound for St. Louis. I knew we would be separated for a while, working in two countries on the paperwork to obtain a fiancee visa. But I didn’t know how long. It seems to me that the waiting was hardest at the beginning (where the elation of getting engaged was followed by the loneliness of returning home alone) and near the end (though we never had a clear idea of when exactly “the end” would come). My mind wandered, remembering those months of waiting, then returned to the present. I thought of our eighth wedding anniversary, just around the corner: Nov. 22 and 24. But even sooner, I thought, our family will move back into the little brick house that was shattered by the Good Friday tornado. Then it struck me: we have gone through another “interminable wait” this year. In some ways it’s been harder. There was little joy at the outset, except maybe the solace that comes from knowing nobody was hurt and many of our possessions could be saved. There were so many unknowns: how do you pick a guy to cut down your tree? We chose one, and it went badly. Our temporary housing moved us farther away from all our usual places. We couldn’t walk Jadzia to kindergarten as we had planned, nor could we walk to the farmer’s market, or the bank, or the library. But in some ways it’s been easier. Yes, we were separated from our house — but not from each other. We’ve been in exile, together. The rental house where we’ve lived was actually bigger than our own home, though it lacked some things (dishwasher). Our friends and family rallied around to help us. And our wait has lasted only six months, not nine. Still, there’s no getting past the waiting. As with our engagment eight years ago, we had a vague notion of how long this reconstruction process would take. But the ending proved to be elusive. We would get close, and things would drag out. At last, though, the finish line is in sight. Today our little house was full of people: cutting tiles, running pipes, painting walls, tracking in mud. Tomorrow our long-stored belongings will begin to arrive at the house. Before the end of the week, we hope to be sleeping in our own beds again. I would like to think that this “interminable wait” helped us, strengthened us inside. … at least, I think that’s how it went. 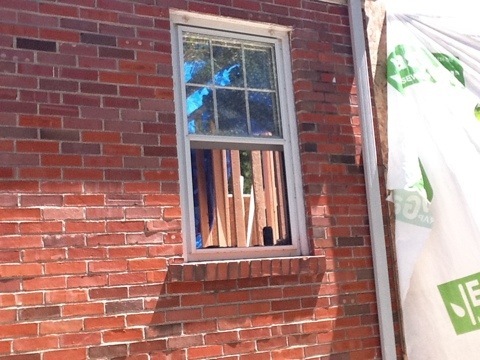 Well, we have new windows throughout the house now! 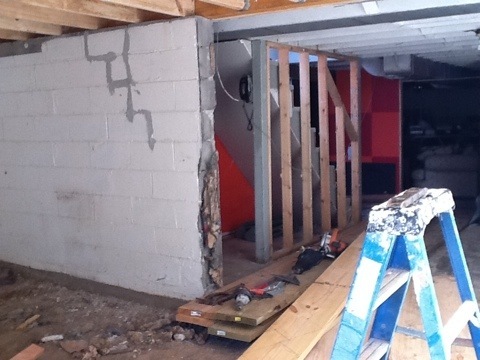 There is more drywall going up, and electrical being put in. This week Jadzia brought home her first report card — or rather “mid-quarter progress report.” Her teacher had very nice things to say, and of course we are proud of how she is doing in school so far. Last week, Jadzia even got to host her grandpa for the school’s “Grandparents Day” festivities. 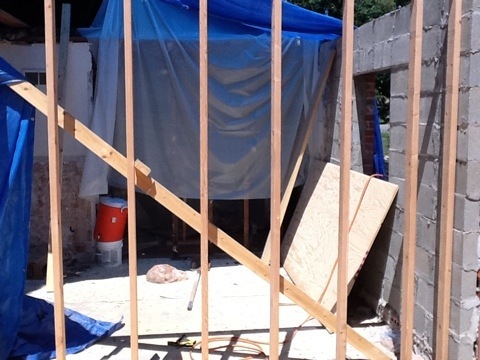 And I suppose it’s time for a progress report of a different kind: an update on our house. Keep reading for some more photos. After a wonderful lunch Tuesday with some current and former coworkers, I took a quick detour to check on our house in Ferguson. 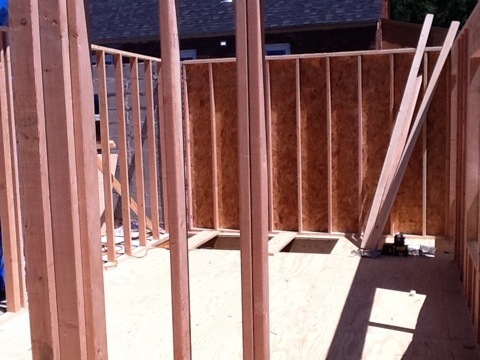 I knew that the workers had begun framing, so I was eager to see walls taking shape. I was not disappointed. Paid a visit to the house today to see how work was progressing, and also because the grass in the front yard was in danger of becoming a forest. What I found was awesome. Lots of works, lots of work being done. 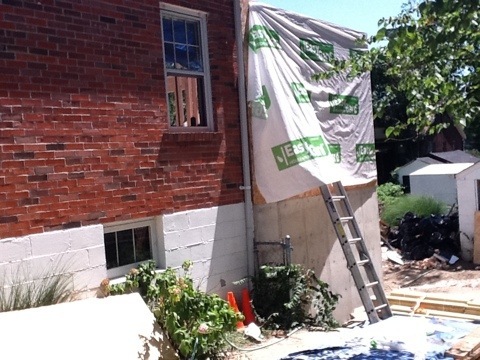 New cinder-block walls are going up near the kitchen and the back yard has a big hole where a new foundation will be poured. My weedwhacker didn’t cooperate, though. I think I flooded it. So I borrowed a neighbors’ mower. I soon remembered that not everybody keeps their mower set as high up as I do (same as my dad). still, the yard looks nice and the house is making progress. Keep reading to see video of the work.